Mint Chocolate Fudge is the perfect balance of smooth, semi-sweet chocolate and cool, crème de mint. It comes together in minutes and makes an excellent gift idea. 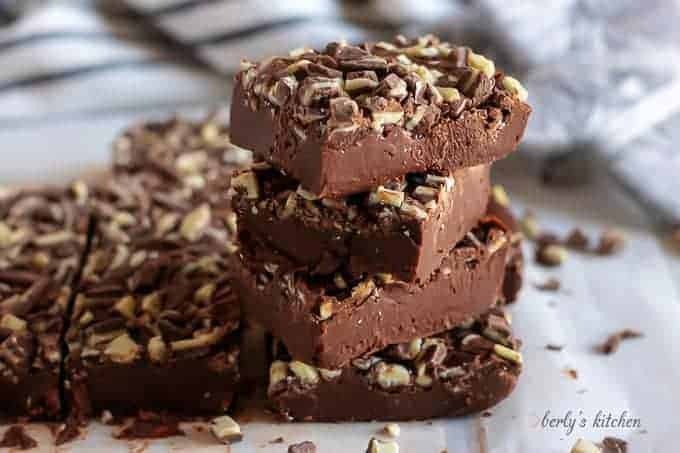 Chocolate fudge is a holiday favorite that’s been around for a long time. In fact, there are some accounts of it’s existence dating back to the mid 1860’s. However, nobody really knows it’s exact origins. Of course, the most popular opinion is that was made by accident when a candy maker messed up a batch of caramel candies. But, who can say, right? What’s important, is how fudge has changed over the years. What started out as a simple one trick pony, has morphed into a candy that can satisfy just about anyone. From bourbon caramel to peanut butter, there’s bound to a be flavor of chocolate fudge you enjoy. Kim and I are huge fudge fans. In fact, we currently feature several different varieties of our favorite candy treat, including a key lime fudge flavor. For today, we’ve decided to re-share our mint chocolate fudge with updated photos. Originally, this post came out in November of 2017, but Kim felt it needed a touch-up. As always with us, simple and tasty is the main idea. This mint chocolate fudge is no different. The hardest part is waiting for it to set in the fridge. Thanks to the sweetened condensed milk the chocolate is smooth and rich. It contrasts wonderfully with the coolness of the creme de menthe. 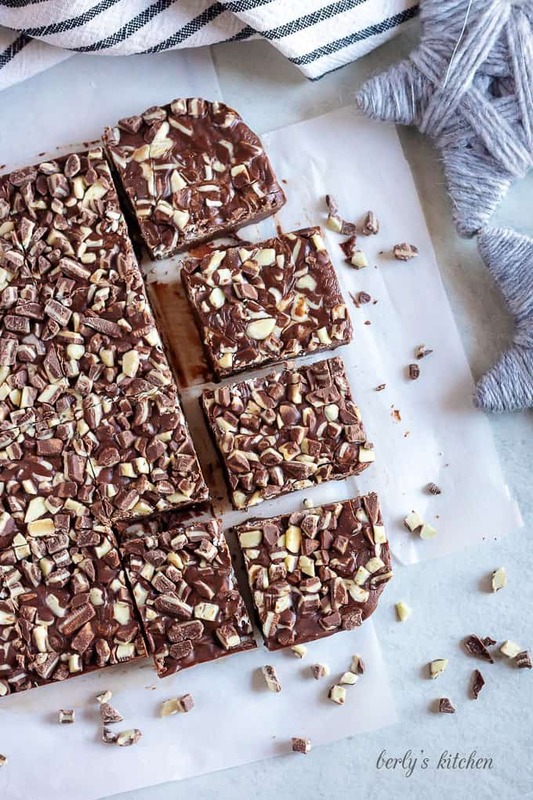 When it comes to festive fudge, it doesn’t get much better than this. But, enough with the details already, let’s get started! 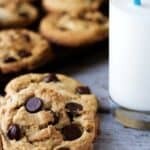 First, by start getting out your chocolate chips, mint chocolate candies, sweetened condensed milk, and vanilla extract. Also, line an 8 x 8 baking dish with parchment paper. (use a little extra) On a side note, if your mint candy came in solid form, chop it up with a knife. Next, pour the sweetened condensed milk and chocolate chips into a medium saucepan. Kim uses a non-stick pan for this step. If you don’t have one, then grease the pan with a little unsalted butter. After that, heat the mixture over medium-low heat for five to ten minutes, stirring constantly. You don’t want the chocolate to burn, so keep that wooden or plastic spoon moving. Now, once the chocolate melts, add your vanilla extract, and combine it with the other ingredients. Carefully pour everything into the baking dish. In case your wondering what it should look like, then take a peek at the picture above. The fudge should be smooth and creamy. 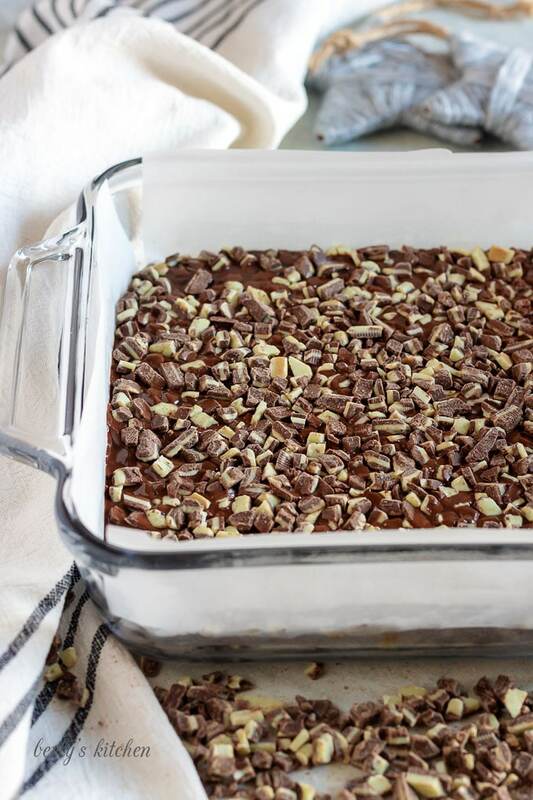 At this point, it’s time to sprinkle the mint chips over the top of the warm fudge. 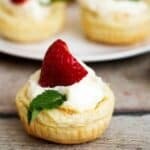 Try to do so as evenly as possible so you get that mint flavor in every bite. Afterward, carefully and gently press the mint pieces into the fudge with your hands. This step helps the chips stay in place when the fudge sets. Last place the fudge in the refrigerator for at least 2 hours or overnight and allow it to set completely before serving. That’s it, you’re all done. Honestly, I can’t emphasize this enough: stir the melting chocolate constantly. Most importantly, please don’t leave it unattended. Nothing is worse than burnt chocolate, well, I guess that’s not true, but you get the point. Remember that extra parchment paper? Well, when you get to the step that directs you to press down the mint chips, use the extra paper to press them into place. Think of it as a parchment buffer between you and the melted chocolate. 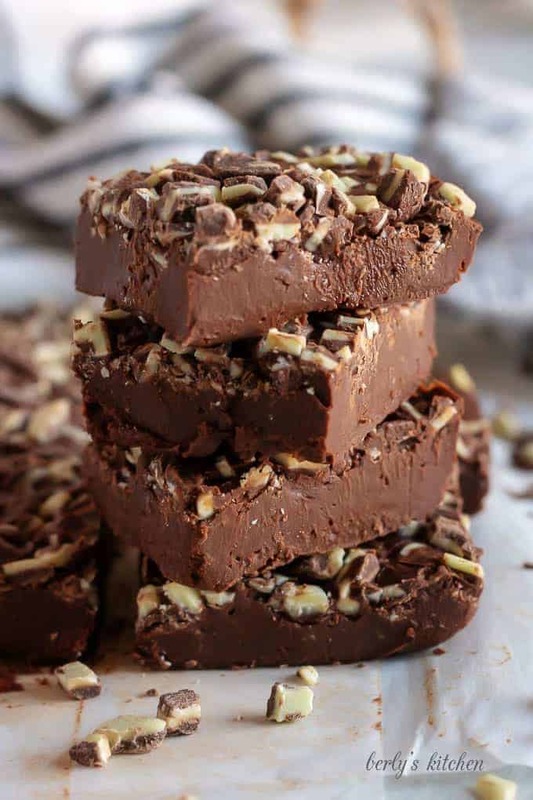 Some fudge recipes say you can leave it on the counter for 4-hours. I wouldn’t recommend doing that with out mint chocolate fudge. I’m pretty sure the mint chips would just melt into a gooey mess. 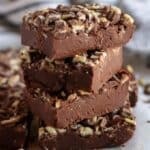 Be sure to get the fudge into your fridge as quickly as possible. For an extra kick of mint flavor, try using a 1/8-1/4 tsp. of spearmint extract. Add it into the recipe when you stir in the vanilla extract. Line an 8 x 8 baking dish with parchment paper and leave extra hanging over the sides. Pour the sweetened condensed milk and chocolate chips into a medium saucepan. Heat over medium-low heat for five to ten minutes, stirring constantly. After the chocolate melts and the mixture combines, remove from heat and add the vanilla. Mix to combine. Then carefully pour it into the baking dish. Sprinkle the mint chips over the top of the warm fudge. Gently press the mint pieces into the fudge with your hands so they will stay in place when the fudge sets. 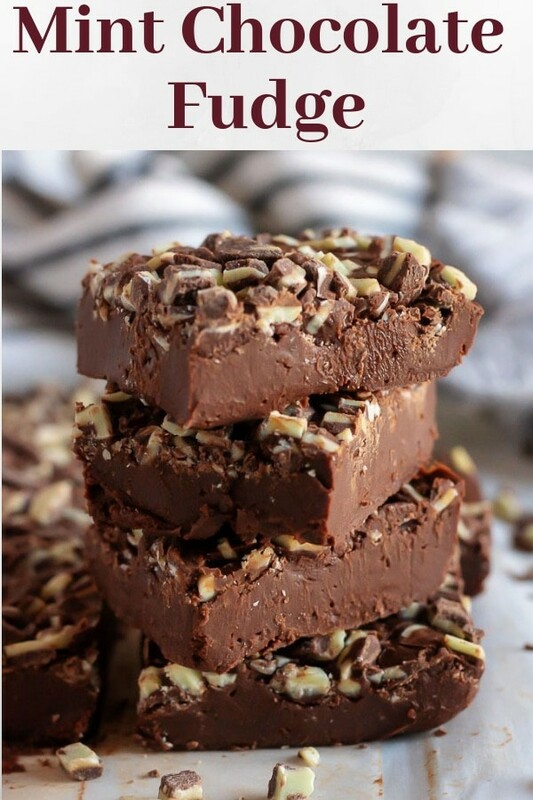 Place the fudge in the refrigerator for at least 2 hours or overnight and allow to set completely before serving. Store any leftover pieces in an airtight container. The calories listed are an approximation based on the ingredients and each piece of fudge is 106 calories. The dish can be prepared in advance and stored in a sealed container in your fridge for up to three days. Good question! 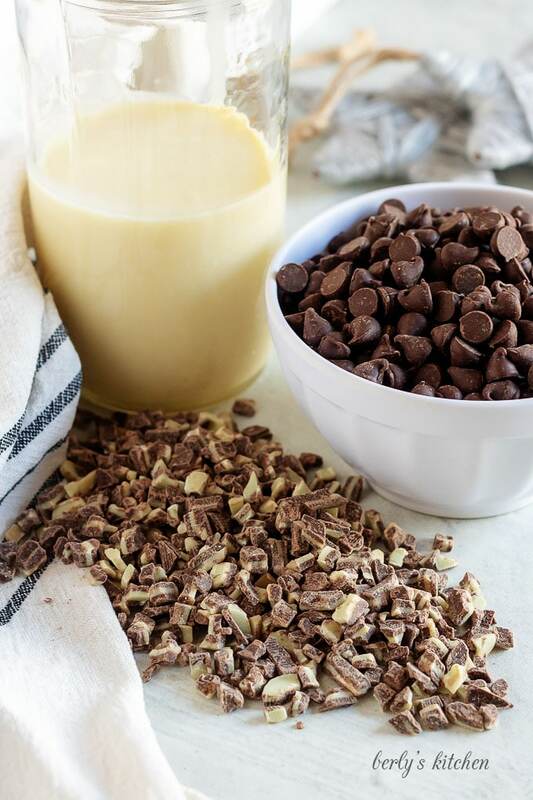 When you’re mixing the sweetened condensed milk and the chocolate chips together, it will start to thicken. 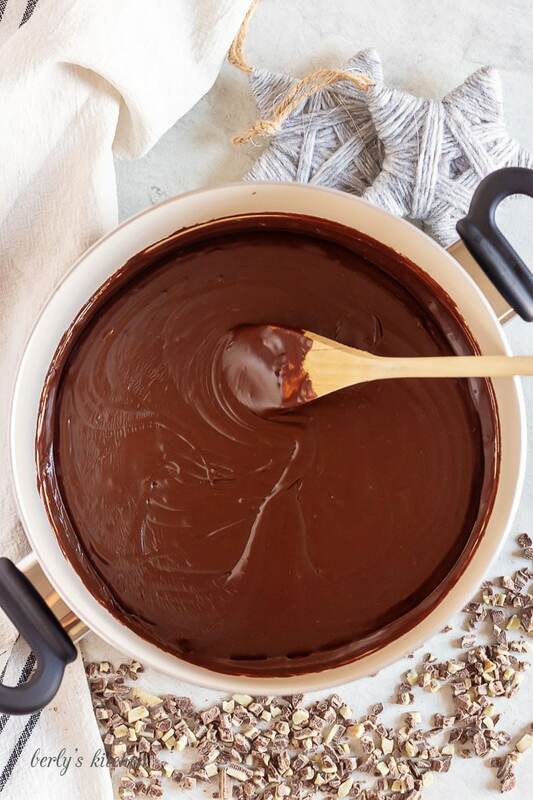 As soon as the chocolate is completely melted, it is ready to be put into a pan. It will be thick especially as it cools, but you should be able to pour it. After you add the mints to the top, let it set in the fridge. The fudge will get firm and be easy to cut. If I were to use Hershey’s mint kisses, how would this work. Opinion please? Hi, Thalua! I think they’d work fine as far as chocolate/mint candy goes. Be sure to rough chop the kisses, and place them in the fridge/freezer until you’re ready to use them. The flavor may be slightly different, but it will still be very tasty!